CARRIER MILLS - A familiar face for local football fans returned to Southern Illinois on Sunday morning, as former SIU football coach Jerry Kill came to share a patriotic message of life lessons learned on and off the field. Now coach at Northern Illinois University, Kill returned to the region to give an Independence Day sermon at First United Methodist Church in Carrier Mills. "As a ball coach, you speak at a lot of clinics and things of that nature, but you don't often speak at a church," Kill said. "I really appreciate the opportunity to come and visit, and it's great to be back in Southern Illinois." 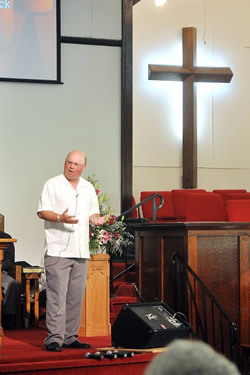 The accomplished coach addressed a crowd of about 150 at the small community church, telling of his life as a coach, a Christian, a cancer survivor, a son and a father. Kill shared a message of faith by describing his own trials and encouraged others to care for each other and appreciate each day as he has learned to since being diagnosed with cancer. At the end of the 2005 Saluki football season, Kill underwent surgery to remove a cancerous tumor from one of his kidneys. Having experienced the illness firsthand, Kill and wife, Rebecca, along with Southern Illinois Healthcare, formed the Coach Kill Cancer Fund to assist Southern Illinois cancer patients and their families with costs associated with their medical treatments. A special collection was taken during the service to be donated to the fund and another will be taken Sunday, July 11. During his message Sunday morning, Kill said he did not want to be remembered for his accomplishments as a football coach, but for the positive impacts he has and will make by giving back to others. The Rev. Stan Irvin, pastor at the church, said the congregation was honored to have Kill speak during the service. "We were thrilled to have him, and we were touched by his message," he said. "It will hopefully motivate people to give back to their community and to one another." Irvin praised Kill for his ability to help his players become better people by applying his Christian values in his coaching methods. "He preaches by the life he lives, by the fundraising he does and by the integrity he instills in people," Irvin said.